Sunday morning was kind of a blur. We got up, got ourselves together, went to look around the awesome Safeway Sis and I had spotted the day before (yes, I get geeky about nice grocery stores), get some coffee, then we checked out of the hotel and headed off to break my three year dim sum fast (I'm not counting the handful of selections available here or the occasional Asian market freezer purchases). 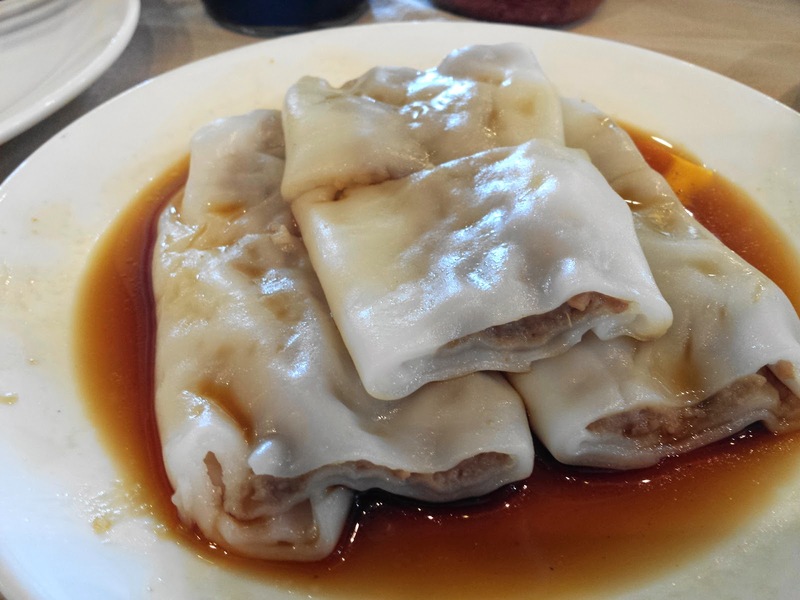 On my first trip to Portland as an adult back in 2010, I did a lot of research on the available dim sum places. The big contenders at that time were Wong's King and Ocean City. I ended up choosing Wong's King, loved the experience, went back again the following year, and it would have made sense to go back there on this trip as well. But of course, I'm me. 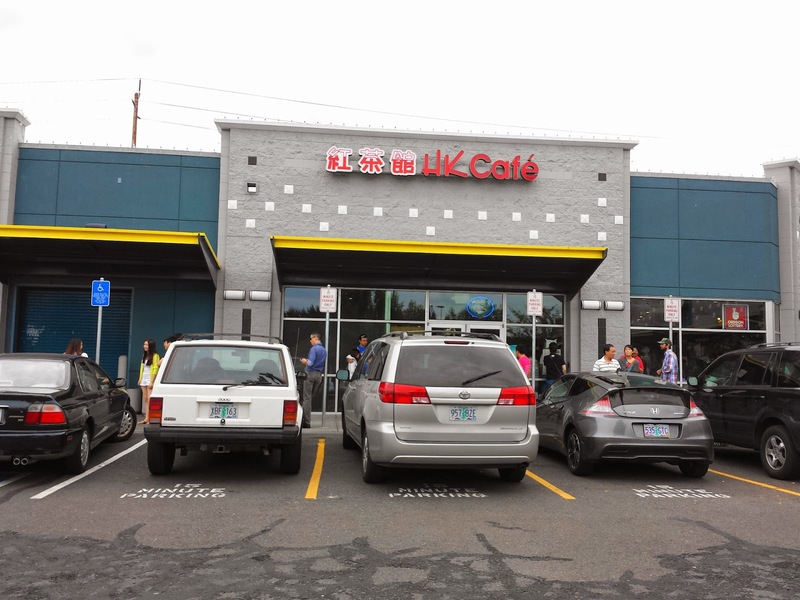 HK Cafe was just opening up when I came through town in 2010. They didn't have any kind of reputation at that time, so they were completely off my radar. In 2011, we just wanted to go back to the same place we had been the year before. 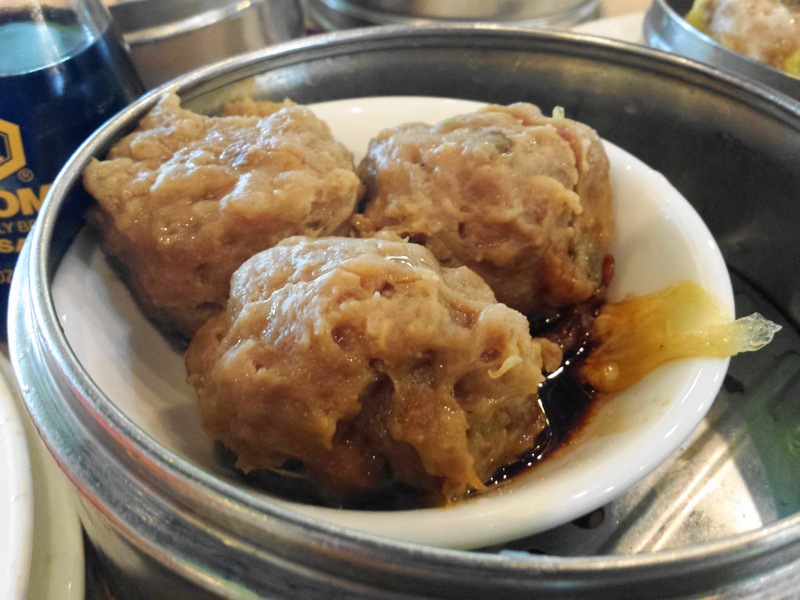 But in the three years since that last trip, HK has built up some credibility amongst the area's dim sum enthusiasts. 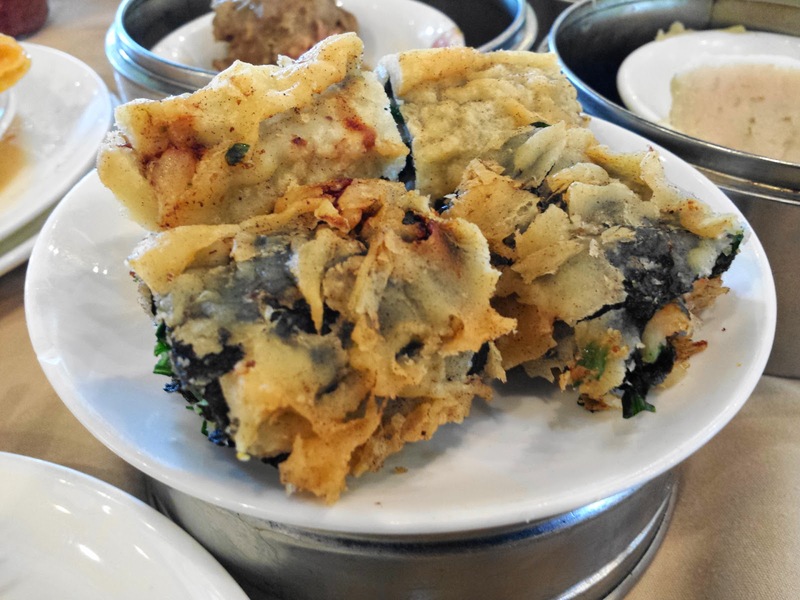 I was feeling a little gun shy after the previous day, but HK has better parking, is in a nicer area, and had some good write-ups in the local press. So as tempting as it was to play it safe, I decided to risk trying the newer place. 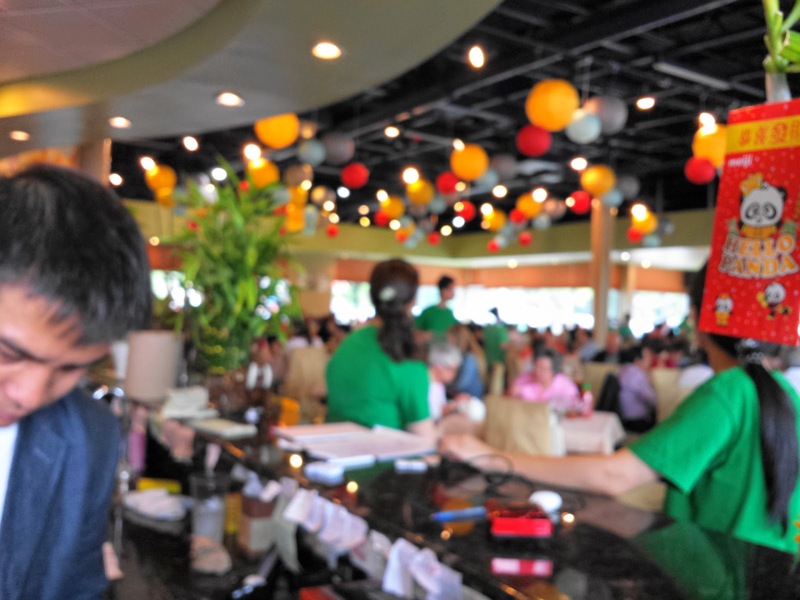 We showed up at the dim sum "magic hour" of 11 am, after the early crowd has come and gone, and while the largest variety of items is in circulation. That being said, it was still busy. After about a 45 minute wait where I had to keep peeking my head inside to see what number they were serving (their entryway was SRO, and packed), we were shown to a table. Before we were all even comfortably seated, we were being approached by women pushing carts full of steaming baskets. Beef in rice noodles. This was the first thing to hit the table, and got us off to a good start. 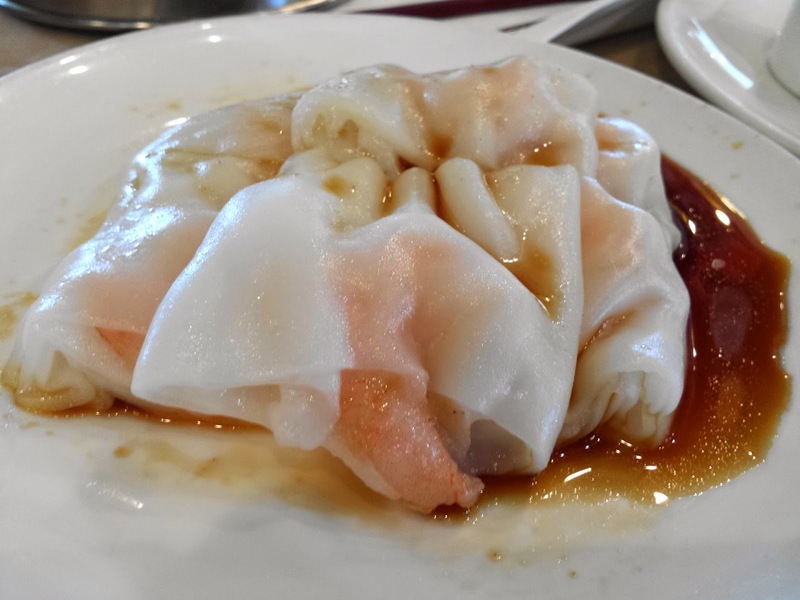 Shrimp in rice noodles. Same thing, but with shrimp. 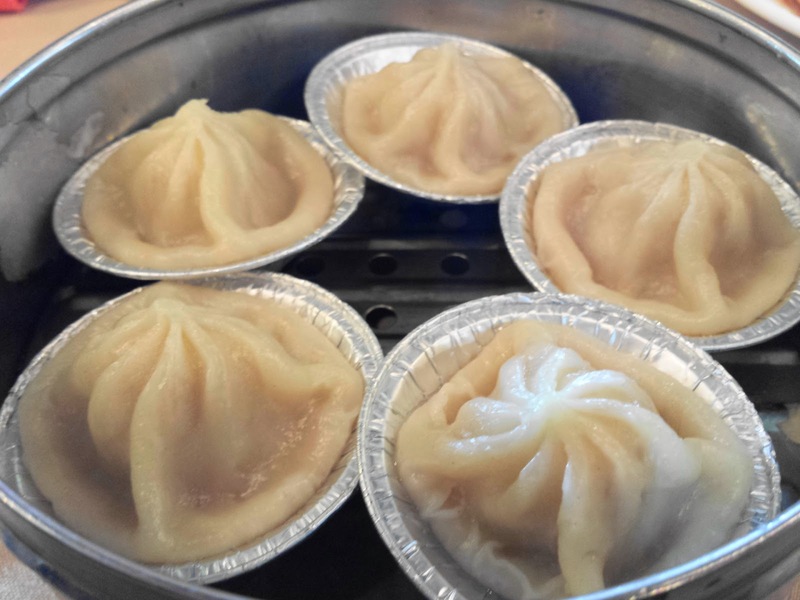 Soup dumplings, filled with a pork meatball and hot broth. 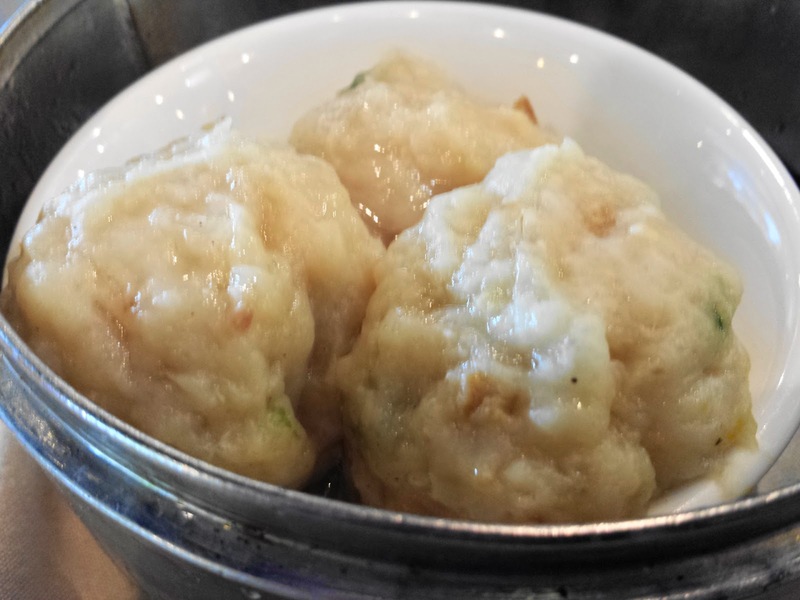 Steamed fish balls. I wasn't a big fan of these at first, but I started warming up to them as we ate. 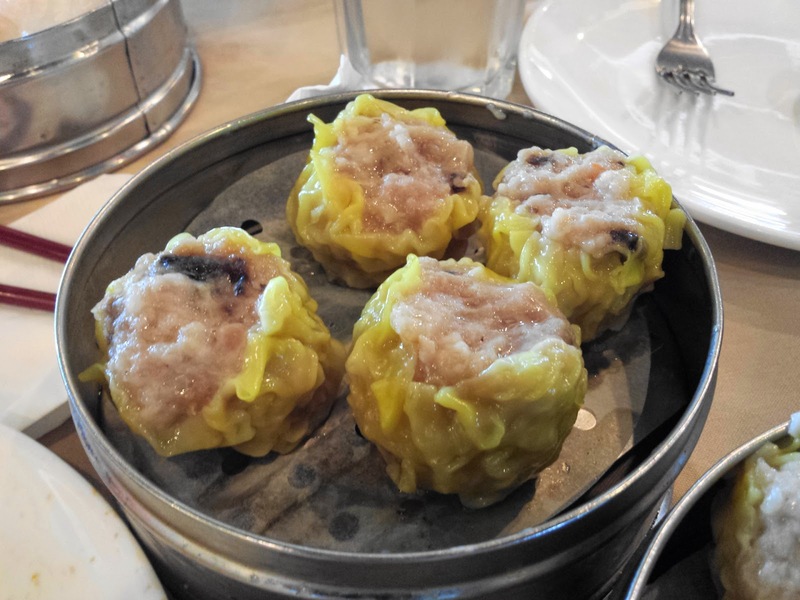 Shu Mai. Good, but not as good as Wong's King. Too bad since they're my favorite. Beef balls. Just steamed meatballs. I'm almost sure of it. 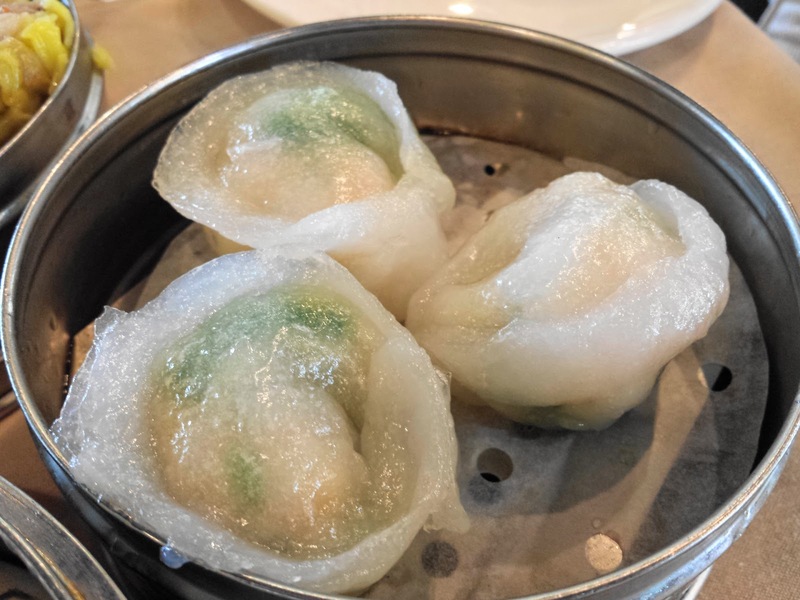 Shrimp and chive dumplings, if I'm not mistaken. Both Sis and I were very taken with these. Har Gow. Another favorite, and we all agreed these were a little better than the ones you'll find at Wong's King. 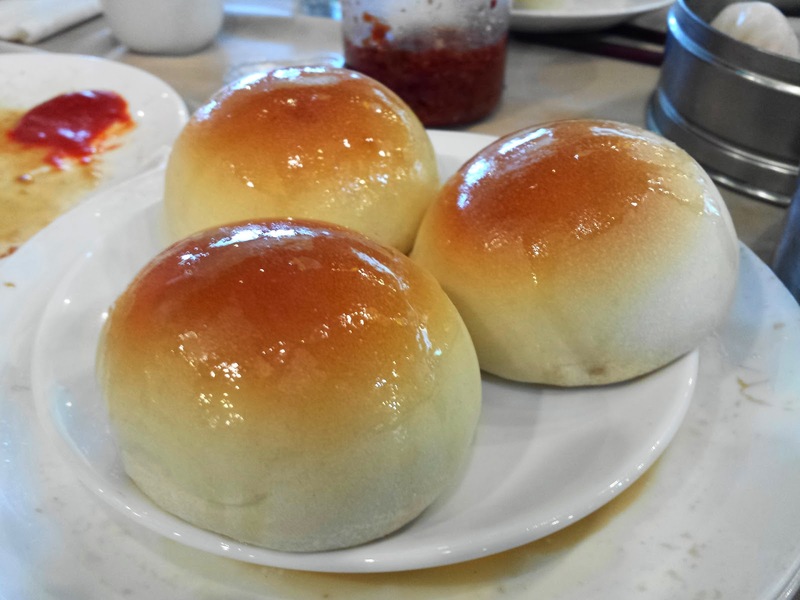 BBQ Pork Buns, some of the better ones I've had anywhere. Fried fish and seaweed roll. 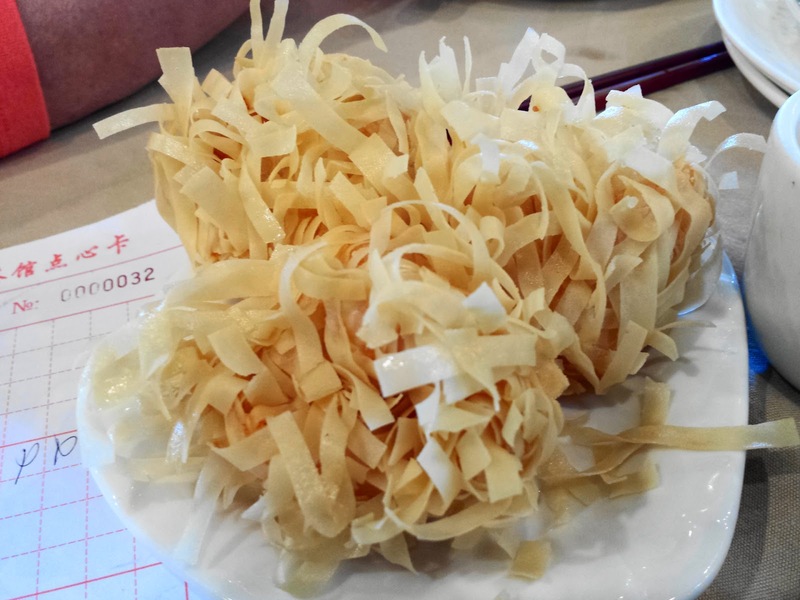 The waitress referred to it as "Chinese sushi". Wong's King has something similar that I enjoy quite a bit. I did not enjoy this. It was cold, which meant the breading was greasy, and the seaweed was so thick in places that you could barely chew through it. Shrimp balls. 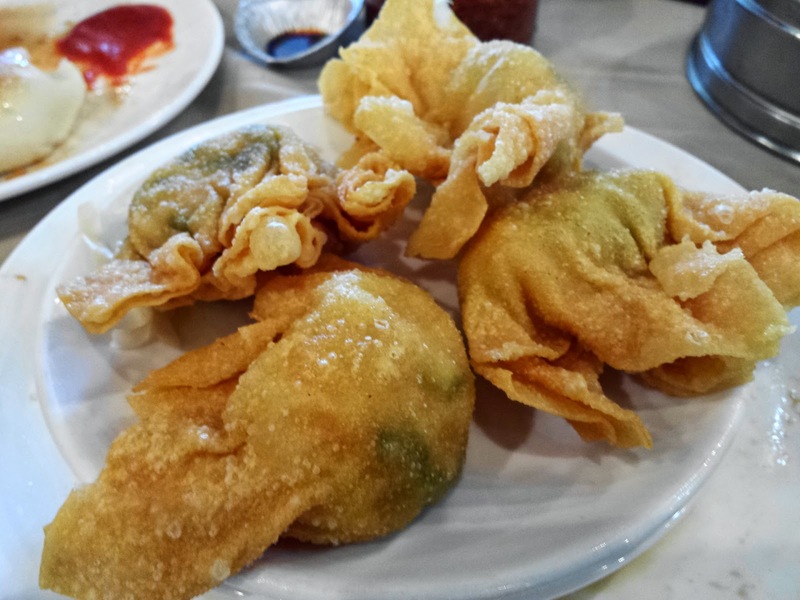 The filling in these was delicious, but unfortunately you had to fight through a forest of fried won ton strips to get to it, making a huge mess in the process. Unfortunately, this is what we ended with. Another cold, deep-fried item, this one filled with shrimp and cilantro. Not a good combination with the things that proceeded it. 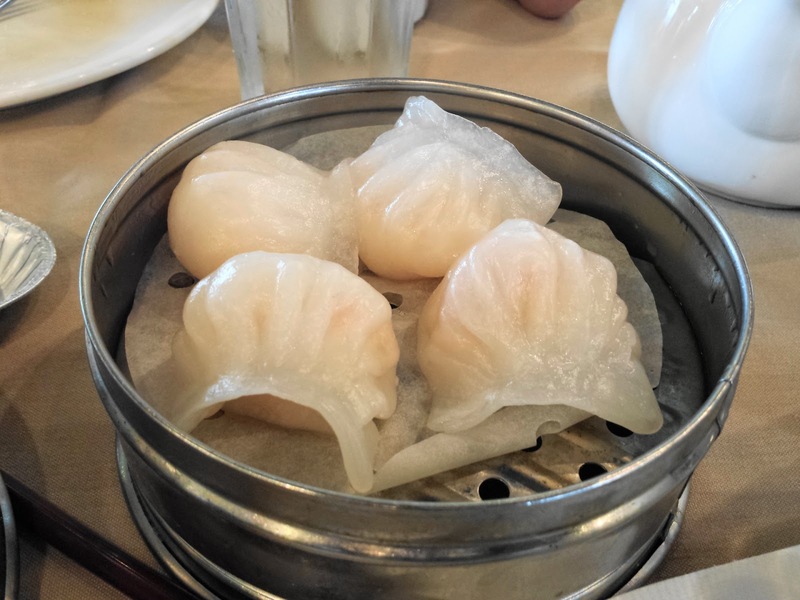 All in all, it was a little pricey (as my dim sum expeditions are wont to be), and everyone agreed it was good. Still, we also all agreed that Wong's King is better in regards to atmosphere and wait times, and overall the food is just a little better there as well. Plus there's no "adults only" video gambling room next to the cash register where sour-faced middle-aged Asian men are traipsing in and out while you're trying to get a number or pay your bill. Even though the food was good, I was hoping to be blown away, and instead I was left wishing we had just gone back to Wong's King. That coupled with the previous day's experiences were putting me in something of a sour mood. After we paid, Mom, Sis and the Tween headed to Tigard to rendezvous with my Aunt. 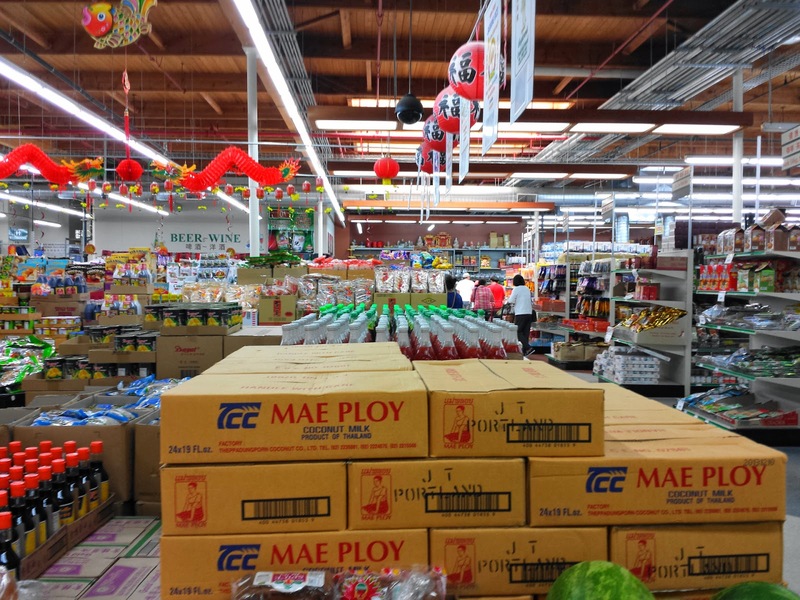 I decided to go off by myself for a while and hit some of my favorite Asian markets. 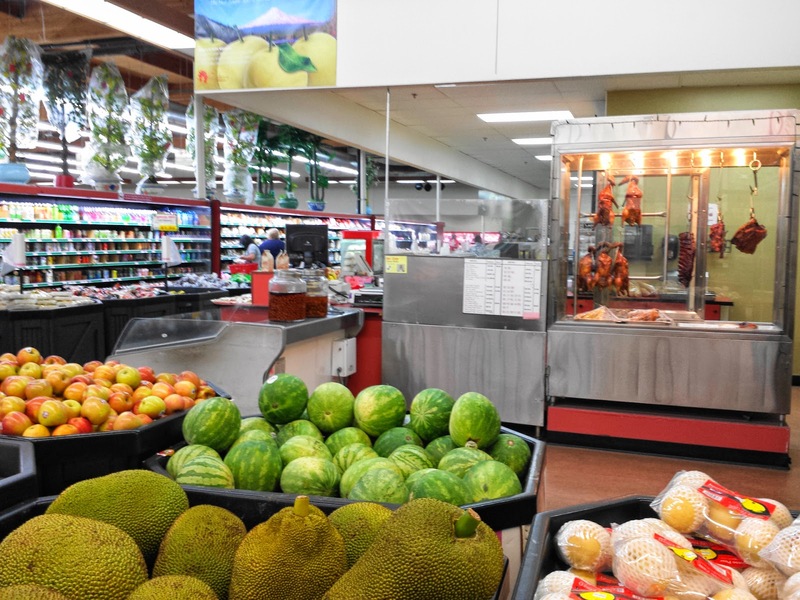 Not because I was hungry or had any intention of buying groceries, I just love the atmosphere, seeing all the unusual items, wishing that our grocery stores here carried some of the items available there. I decided to start with Fubonn Shopping Center. Fubonn is a small, indoor mall. 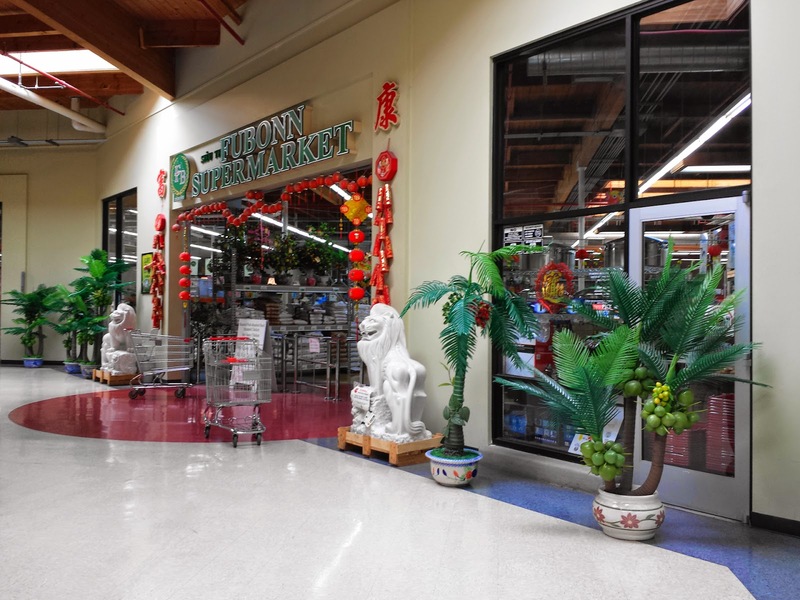 The bulk of the space is taken up by the Fubonn Supermarket, which is kind of the WinCo of Asian markets. It's big, there's a lot of selection, but aesthetics don't seem to be a top priority. The place could use some spit and polish, if you know what I mean. ...trust me, it gets less photogenic. I'm not even going to include the pics of the meat and fish section. Did I mention that this place prohibits photography? I've gotten pretty good at this covert thing over the years. Anyway, it's definitely worth a look-see. 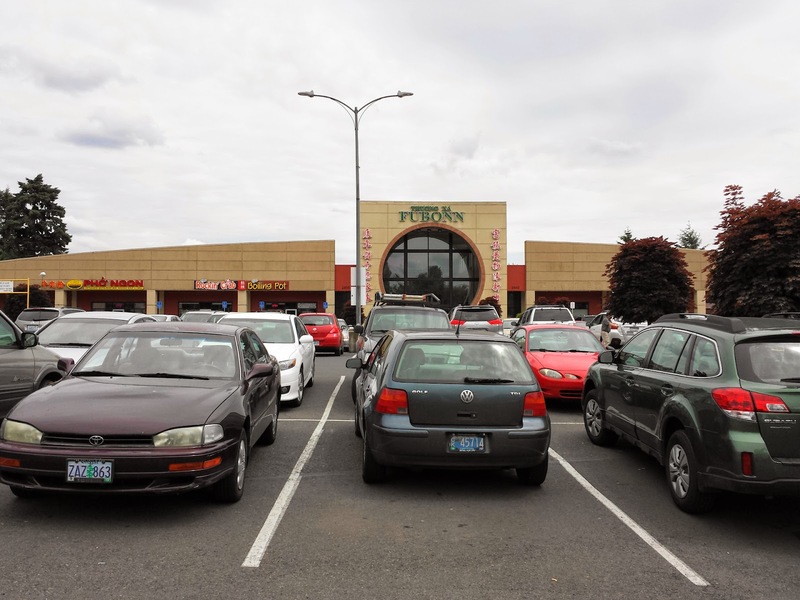 The mall also contains some gift shops, a bakery, a candy shop, and several eateries including a Korean BBQ restaurant, a Vietnamese restaurant, a Sushi restaurant and a seafood joint. 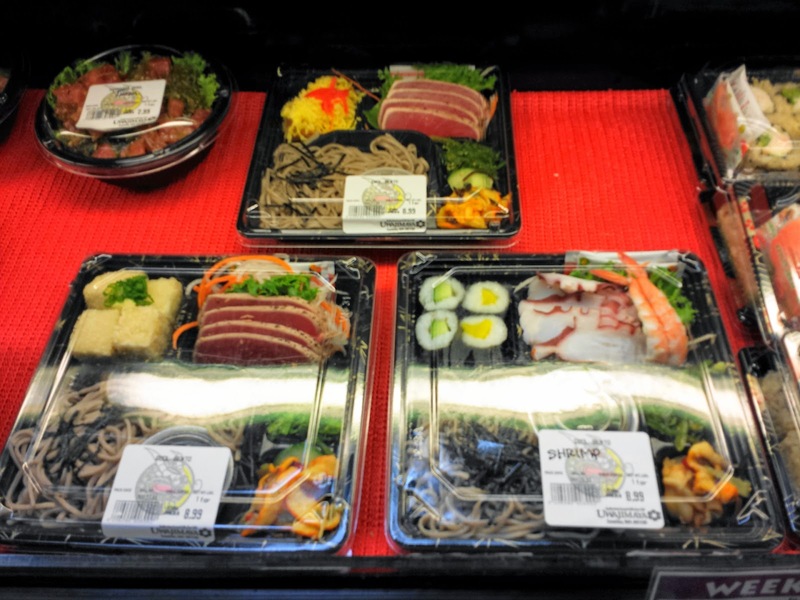 After Fubonn, I stopped by Uwajimaya in Beaverton, a place I've visited and adored on every trip, but I have to say that after visiting the flagship store in Seattle last year, the Oregon branch seems kind of quaint by comparison. Still awesome though. Then it was on to Albany to visit with the family for a while, and hit Starbucks for the second time on this trip. From there, I went on alone to Newport for a little solitude. And seafood. Unfortunately I arrived at the coast later than I expected and, seeing how it was a Sunday night, restaurants were beginning to close. I had been flip-flopping back and forth between a couple of restaurants, but since one of them was closing in about half an hour, it made the decision somewhat easier. Ocean Bleu at Gino's has an odd name and a large following. They were packed solid an hour before closing. 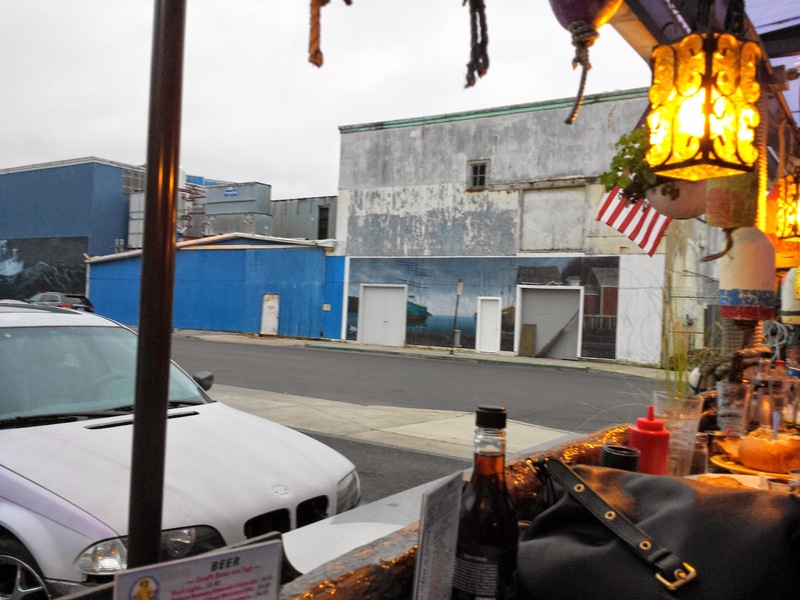 The waitress asked apologetically if I would mind sitting at the patio bar. I didn't mind in the slightest. The bar is a saving grace when one is dining alone, after all. People seem to focus a lot more on you if you're sitting at a table solo. Granted, the view sucked and it was getting increasingly windy out, but that wind carried the scent of the ocean with it. 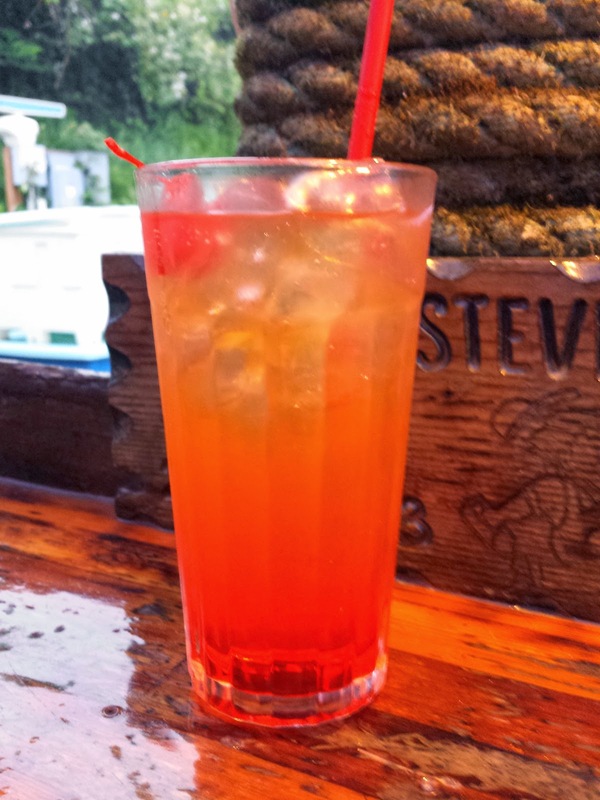 As much as I wanted a drink, I was intrigued by something on their non-alcoholic mixed drink menu called a Cherry Bomb, basically a Shirley Temple with Mountain Dew in place of 7-Up. There were several things on the menu that appealed to me, the Smoked Wild Seafood Platter especially, but I decided I couldn't handle it on my own and I did NOT want leftovers smelling up my hotel room. That left me to choose between the Dungeness Crab and the Pan Seared Rockfish. I was a little wary of the latter, especially after the previous day's taco experience, but still very curious. 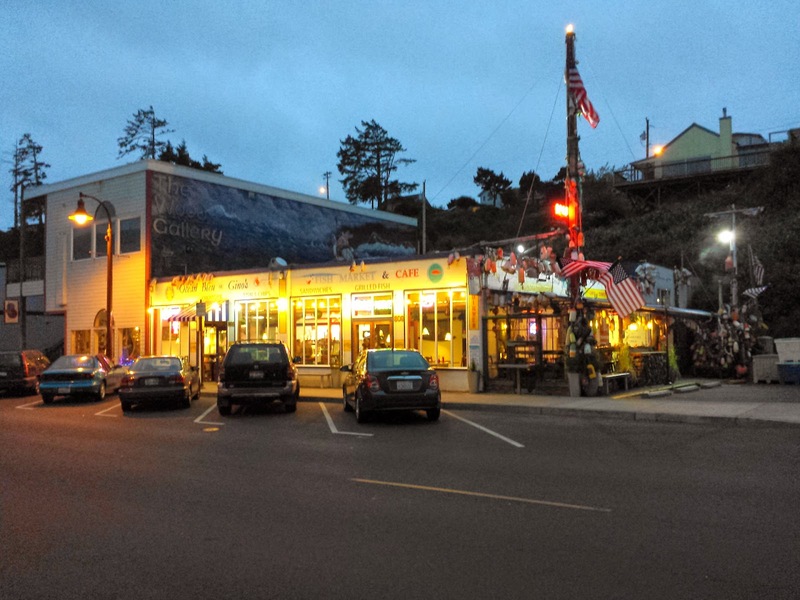 Rockfish is on pretty much every menu in the area, as it's a local catch. I finally decided to have the Dungeness Crab Cocktail as an appetizer, and the Rockfish for my entrée, but when I tried to order it I was informed that the crab was off for the day. Fine, just the rockfish then. 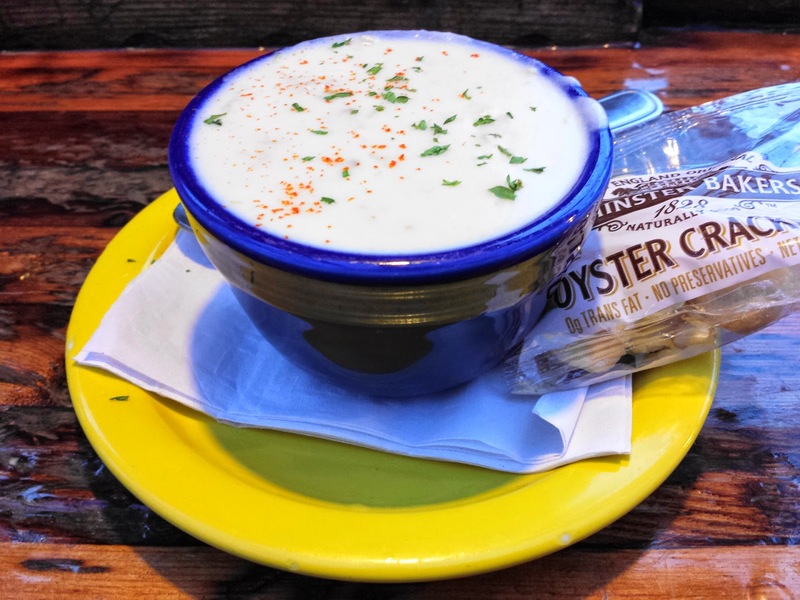 The waitress asked if the clam chowder would be okay to start with, and when I asked her if she recommended it over the seafood stew, I was told that they were out of that as well. Gino's Homemade Clam Chowder is described on the menu as being made with house smoked bacon, but I didn't taste any. I also didn't taste any clams, nor did I come across more than a few chunks of them in the entire bowl. The chowder resembled warm papier mâché paste more than anything else. Even some black pepper would have helped immensely, but I didn't spy any around from where I sat, and the waitresses were so busy that I assumed I wouldn't see one again until they brought the rest of my food (and I was correct). I ate as much as I could bring myself to before finally pushing the bowl aside. I did perk up when the waitress set my dinner plate down in front of me. 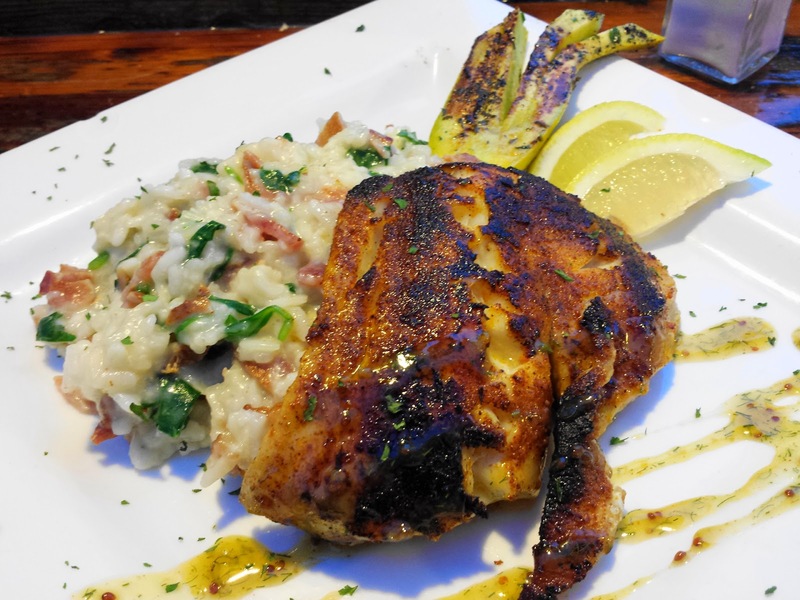 The rockfish is blackened before being pan seared and drizzled with a honey mustard vinaigrette, and is served with sauteed spinach and bacon risotto, and grilled zucchini. Unfortunately, it wasn't as good as it looked. I've never met grilled zucchini that I didn't like, but the risotto was very disappointing. There was indeed quite a bit of bacon and spinach visible, but what it mostly tasted like to me was overcooked rice and Parmesan cheese. As for the rockfish itself, I can't imagine it gets much fresher than this, and it was a marked improvement over what I had the previous day. It was cooked well, and they didn't go overboard with the seasoning or the sauce, but it's still very firm, and I'm not crazy about the flavor. I get that it's local and all, but I just simply didn't dig it. I don't see a lot of rockfish in my future. So, my annoyance at the string of mild disappointments that had plagued this whole trip continued to grow. While I waited for the check, I popped the cherry from my drink into my mouth, bit down, and immediately regretted it. I don't know where they're getting their cherries from, but it's time to find a new source. This thing had a strong, chemical flavor that immediately made me feel slightly nauseous, especially when I thought about the fact that it had been soaking in my drink the entire time. With as much dignity as I could muster, I stepped off the patio into the parking lot and spat it on the ground. Here's where I'm going to surprise you: I would actually eat at this place again. Why? Because of the fried foods. Every order of fish and chips that was delivered to one of the other diners around me looked absolutely amazing, and apparently they're somewhat famous for their popcorn shrimp. I figured that spending some time by the water might help my mood, but that was easier said than done. The Bayfront is clogged with tourist destinations, fishing businesses and eateries. Pretty much every place you could get to the water was chained off or had signs posted that nobody was allowed to pass after business hours. Eventually I did find a little wooden walkway with benches and one of those viewing things that I couldn't use because I was a nickel short, not that it mattered much. At that point it was pitch black out, and all you could see were the boats that had docked for the night. I did get to listen to some sea lions talking to each other, but that's hardly a relaxing sound. I decided to check out the rest of the street, eventually passing by the restaurant that I had wanted to eat at in the first place, and was surprised to see that it was still about 25% full. I guess that they don't rush you out the door at closing time, and the smells coming from the place were intoxicating. This reminded me that I still wanted a drink, and I knew just the place for it. 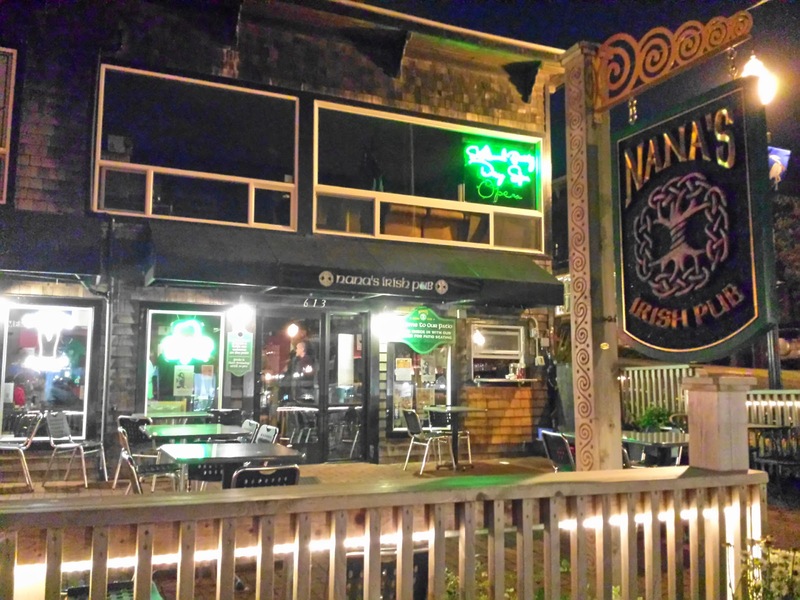 Nana's Irish Pub is a place that I had researched and was curious about, but I was only going to be in town for one night so I didn't think much more of it, at least until my roommate texted me earlier in the evening that she was having dinner there and it was amazing. 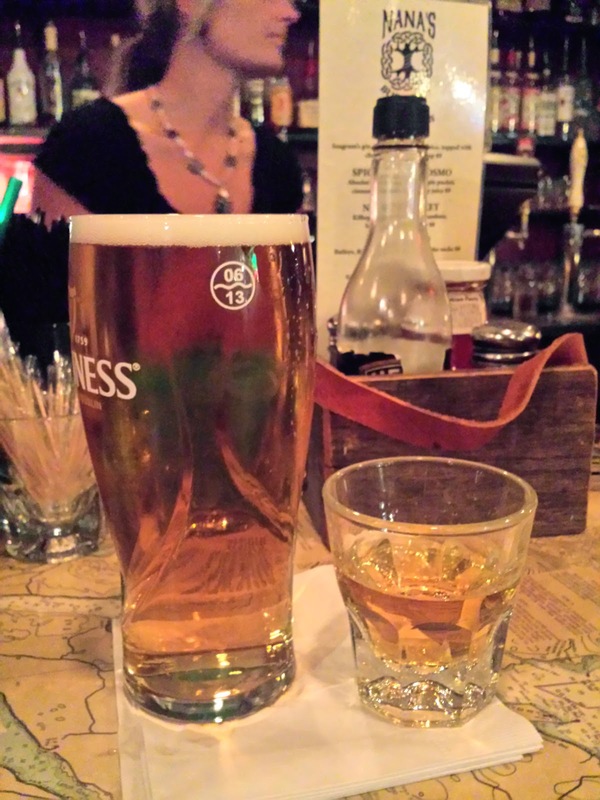 I certainly didn't want more food, but Irish pub means Irish beer and whisky.